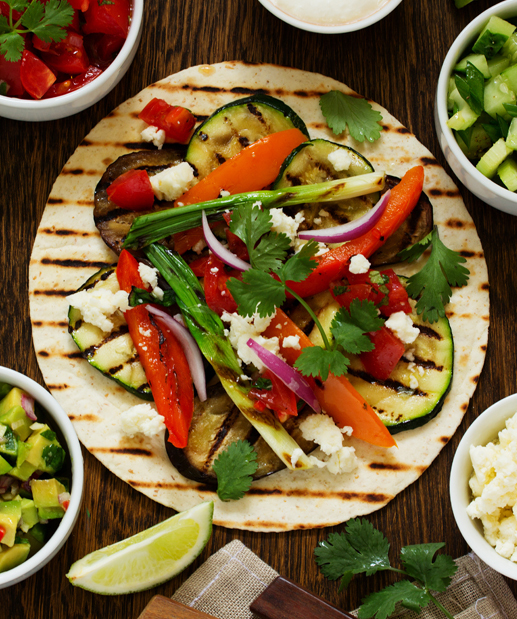 Fajitas are a fun way to allow children some choice in putting together their meals. Consider adding chicken, beef or shrimp to the marinade for variety. Other spring and summer vegetables like asparagus, squash, or eggplant are also excellent choices for this recipe. Sauté the vegetables the night before, reheat in the morning and send them to school in a thermos with the toppings like cheese and guacamole on the side (see Guacamole with Baked Tortilla Chips recipe). Bigger kids will love assembling their own fajitas at lunchtime. 1. Combine oil, vinegar, cumin, half the salt and half the pepper in a large bowl. Add the peppers, squashes, carrots and yellow onions and marinate in the refrigerator for 30 minutes. 2. Combine tomatoes, red onion, lime juice, jalapeno, cilantro, garlic, and remaining salt and pepper to make a salsa. 3. Sauté the marinated vegetables until just soft. 4. Warm the tortillas. Serve with sautéed vegetables and salsa.